You’d have to be bonkers to ride a bicycle along the narrow, congested streets of Kuta, Seminyak or any of the popular coastal areas of southern Bali. But veer inland and you’ll find a seemingly never-ending network of zigzagging country roads and single tracks, where motorised vehicles are few and far between and the knockout natural beauty for which the Indonesian island is renowned stretches to the horizon in every direction. To show you how it’s done, we road-tested three guided bike tours in three beautiful parts of the island of the gods. A string of small, scalloped sandy bays and fishing villages on Bali’s spectacular east coast, Amed is reminiscent of Kuta in the 1970s. 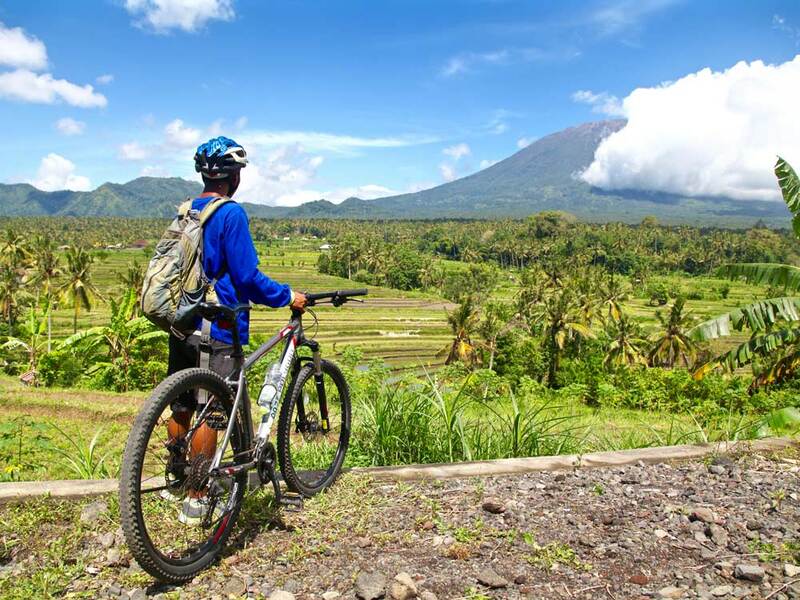 It’s also the base for East Bali Bike Tour, a small, family-owned company that specialises in downhill mountain-bike tours from Mount Agung — the island’s highest and holiest mountain, which looms large over eastern Bali. Tours start with an hour-long drive in a minibus from Amed to Pasar Agung, an ancient temple set in the clouds at 950 metres above sea level. There, riders jump on mountain bikes and follow their guide, Mono, down an undulating sealed road riddled with switchbacks that lead to Nanca, a village of 200 locals known for cultivating snake fruit — a small, leathery fruit the size of a plum that tastes like pineapple. From Nanca the route hits a bumpy fire trail that cuts through thick, green jungle, before rejoining the tarmac for a long, thrilling downhill ride to the lowlands, where Bali’s emerald-green rice fields dominate the landscape. From there Mono hacks and packs the route to suit riders’ particular competencies. After six hours of nonstop downhill fun, the ride comes to an end at Virgin Beach, where the group enjoy lunch at a beachfront restaurant and a swim in the azure Bali Sea, before jumping back in the minibus for the drive back to Amed. The spiritual capital of Bali, Ubud is best explored on bicycle, and dozens of small shops offer them for hire. But don’t rely on Google Maps to guide you through the labyrinthine pathways and jungle trails that are regularly washed away during monsoon season and rerouted around newly formed creeks and riverbeds. To help holidaymakers navigate their way through the ever-changing maze, the Four Seasons Resort at Sayan, on the outskirts of Ubud, has introduced the Bongkasa Village Biking Adventure. Suited to those who’ve never ridden a bicycle off-road and for families with children, the soft, three-hour journey starts with a 45-minute trip in a luxury, air-conditioned four-wheel drive from the Four Seasons to Bongkasa. From there the tour takes riders through 20 kilometres of tropical plantations, river valleys, canals and rice terraces so magical you may have to pinch yourself. As well having one of Bali’s most experienced guides on board, Rudy’s employer, Infinity Mountain Biking, also has the best bicycles on hand. Full-suspension downhill enduro bikes come with 150mm shock absorbers that make light work out of rocks, bumps and holes. And just as well, because Infinity’s most popular tour (a 30-kilometre downhill ride from Mount Batur’s crater to Ubud) is riddled with technical challenges. Tours begin with a 7am pick-up from your hotel or villa anywhere in Bali for the drive up to Penelokan — the ‘Rooftop of Bali’ — and a bird’s-eye view of the Batur crater and lakes. From there, a short drive to the starting point at Abuan village throws riders right into the thick of it on a muddy single track that cuts a rough path through the jungle and its tricky, uneven terrain. After a short coffee break, the tour continues on a screaming downhill path along gravel roads and fire trails, passing Gunung Raung, a majestic Balinese temple famed for the two white stone bulls guarding the entrance. Another short break later, riders take on the Campuhan Ridge Walk, a narrow stone pathway that meanders along the edge of a deep river valley where part of the movie Eat Pray Love was filmed. 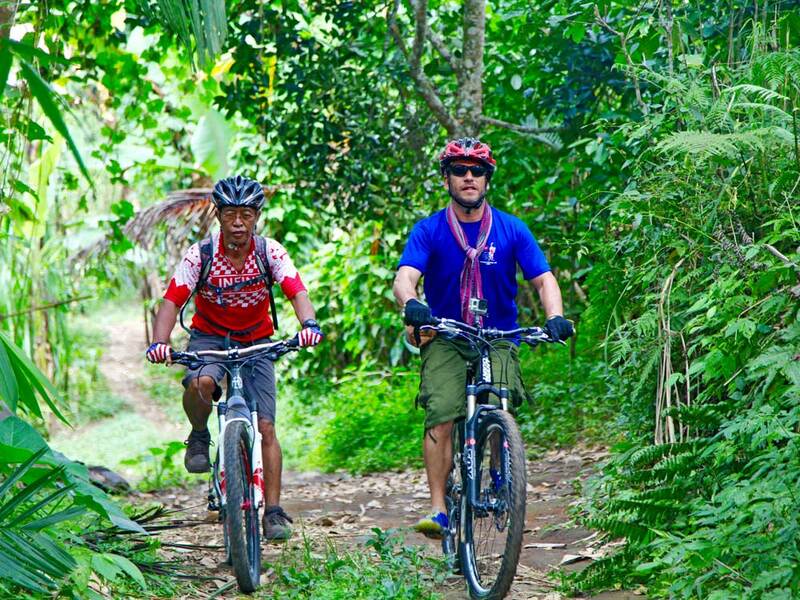 East Bali Bike Tour in Amed offers six-hour guided downhill mountain bike tours for $113 for one or two riders including lunch.